With Nudo you can select a tree online from a number of different groves. For just $130 US dollars you can adopt a tree and receive fresh olive oil products all year long. 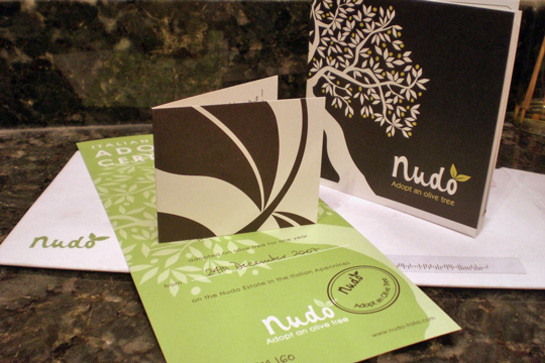 I ordered a tree this year for my mother (another real olive oil lover) and she was delighted to find Nudo would be delivering virgin olive oil to her doorstep periodically throughout the year. You can also go and visit your tree if you are up to it. A photo from the initial package is shown below.